This is so sad. This is such a beautiful cathedral. What a terrible loss. I was about to make a post about this. All that human history just gone. How did the fire even start? Makes me think that someone lit the fire on purpose. I have vivid memories of visiting Notre Dame many years ago. The cathedral was so beautiful with those spectacular rose windows. What a tragedy!!! I hope it wasn’t deliberate, no one was hurt, and they keep it from spreading. Most important is that no one is hurt but it’s sad nonetheless. Sorry @Moonbeam,I made similar post.If you want you can erase it. 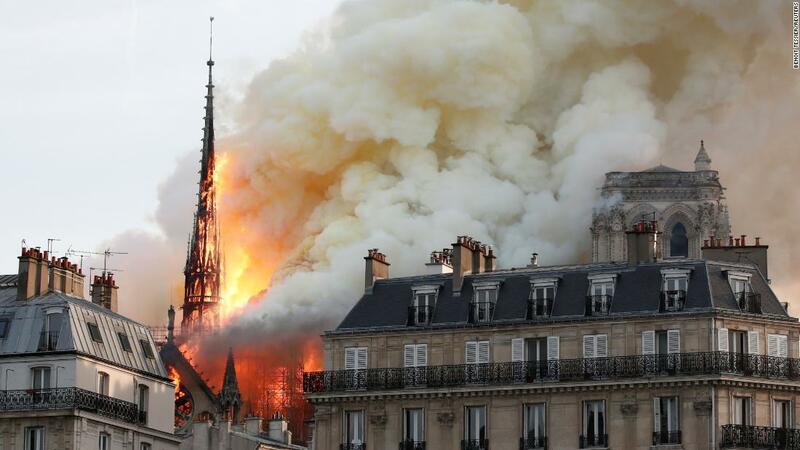 Very sad, irreplaceable world-wide landmark. They think it was an electrical fire when they were doing renovations/restorations because it was in badly need of a fix up for years now. Still sad. I went there when I was 13. I don’t have TV but it looks terrible. The spire fell, and they are talking about vacating the island. It’s awful! I’m watching it from some chanel I found,I’m tired but it’s great shame.Can’t stop watching. I saw it on a livestream on Facebook. I saw it on the news. What a shame! Has anyone learned how the fire started? I either missed that part, or they didn’t say. Apparently @ninjastar removed my post to this one.Hope you guys don’t mind. I keep thinking if there was just a guy there when it started to stamp it out or call for firemen early. To think something this huge and important can be taken down by a common electrical fire.